During the period from late 1966 until 1969 the old steam shed at Worcester was used for the temporary storage of a large number of diesel locomotives. These locomotives were surplus to requirements and many were sold to private owners whilst others went for scrap. The following details have been gathered together from various sources to provide a record of this period at Worcester. The Swindon built 204hp diesel shunters were a familiar sight at Worcester as engines of the class had been allocated since 1960. Most of the class 03 shunters that were stored at Worcester were in a serviceable condition and if the depot was short of motive power one or more would be used to cover the shortage. In this list therefore it is difficult to differentiate dates as between stored or in use, particularly as some of the locomotives were allocated to Worcester. It is however believed to be comprehensive and to include all of the class 03's that were stored at Worcester. This locomotive was allocated to Swindon. Not recorded there 8/9/68. There are no reported observations of this locomotive in store at Worcester. It was not seen at Worcester on visits on 9/6/68, 24/7/68 and 26/7/68. To Birds Long Marston ex Worcester 9/68 (or 8/68). Cut up 1/75. This locomotive was allocated to Worcester in April 1966 but was actually outbased at Hookagate. There are no reported observations of this locomotive in store at Worcester. It is the view of the MIAC that the reference to this locomotive in store at Worcester is incorrect. It is believed to have been stored at Shrewsbury shed and Chester. To Cohen, Kingsbury for scrap 1968. To Cohen, Kingsbury for scrap after 26/7/68. Cut up 10/68. Transferred to store at Worcester 9/68. There are no reported observations of this locomotive in store at Worcester. Returned to service at Swindon 1/69. Sold to National Coal Board 10/70. Returned to service at Lincoln 11/1967. Returned to service at ? Cut up at Doncaster BREL Works 12/77. To Adams, Newport after 26/7/68 and before 29/10/68. To Cashmore, Newport for scrap after 29/10/68. Cut up 12/68. Returned to service at Norwich. Cut up BREL Doncaster Works 11/83. To Birds Long Marston for scrap after 4/5/69 and before 29/6/69. Cut up 4/70. 27/8/67; 12/9/67; 16/1/68; 16/4/68; 9/6/68; 24&26/7/68; 29/10/68. To Adams, Newport between 29/10/68 and 2/2/69. 16/1/68; 16/4/68; 9/6/68; allocated to Landore 6/68; noted stored at Worcester 29/10/68; 2/2/69; 12/4/69; 4/5/69. To Birds, Long Marston for scrap after 4/5/69 and before 29/6/69. Cut up 5/70. 29/10/68; allocated to Bristol 11/68; noted stored at Worcester 12/4/69; 4/5/69. 29/10/68; used at Worcester; noted stored at Worcester 2/2/69; 12/4/69; 4/5/69. To Birds, Long Marston after 4/5/69 for use and before 29/6/69. Cut up 10/78. Allocated to Swindon. Noted on Swindon shed 4/2/68 but not recorded there 8/9/68. There are no reported observations of this locomotive in store at Worcester. To Birds, Long Marston ex Worcester (or Swindon). Cut up 6/78. Allocated to Taunton. Noted on Swindon shed 4/2/68 but not recorded there 8/9/68. To Birds, Long Marston ex Worcester 9/68 (or Swindon) for scrap. To Birds, Long Marston after 45/69 and before 29/6/69 for scrap. 12/9/67; 16/1/68; 16/4/68; 9/6/68; 24&26/7/68. To Cohen, Kingsbury for scrap after 26/7/68. Cut up 11/68. Allocated to Bristol (11/68). Withdrawn 1/69. Noted on Swindon shed 8/9/68. (Not recorded at Worcester 2/2/69); 12/4/69; 4/5/69. To Adams, Newport 10/69. Cut up 1/81. Allocated to Worcester 12/66. Noted in use at Worcester 16/1/68 and 16/4/68. To Birds, Long Marston for use after 2/2/69 and before 12/4/69 (or despatched 5/69). Cut up 7/78. Allocated to Bristol. Noted at Bristol 19/10/68. To Llanelly Steel Co Ltd after 4/5/69. Cup Up 9/81. Noted at Gloucester 22/7/67; stored at Worcester by 27/8/67; 12/9/67. Returned to BR service at Swindon. Noted on Swindon Works 22/9/68. This photograph shows (from left to right) at least three possibly four unidentified stored class 22 diesel locomotives and a pair of class 03 diesel shunters, one of which one is No.D2177 which was stored at Worcester in the period 1968/69. The photograph is the copyright of Robert Cooke. N.B. There may also be other class 14 locomotives stored at Worcester in addition to those on this list. All of these locomotives were allocated to the Western Region during their time in store at Worcester. The first locomotives to be stored at Worcester started arriving in the middle of December 1966, just before the start of the school holiday. It had been intended to transfer the entire class to the North Eastern Region of British Railways. However, in the event, only 20 locomotives were transferred to Hull Dairycoats in December 1966 and some of those at Worcester were returned to service on the Western Region. It is quite probable that all 20 of those transferred to Hull passed through Worcester at this time as this was used as the staging point from which the locomotives were gathered together in batches before being sent north. The last to leave was D9554. Four more locomotives arrived in April or May 1967 for storage and these also went to Hull Dairycoats. A further six locomotives arrived towards the end of 1967 or early 1968 but two soon returned to service and the other four were all despatched to scrapyards in 1968. 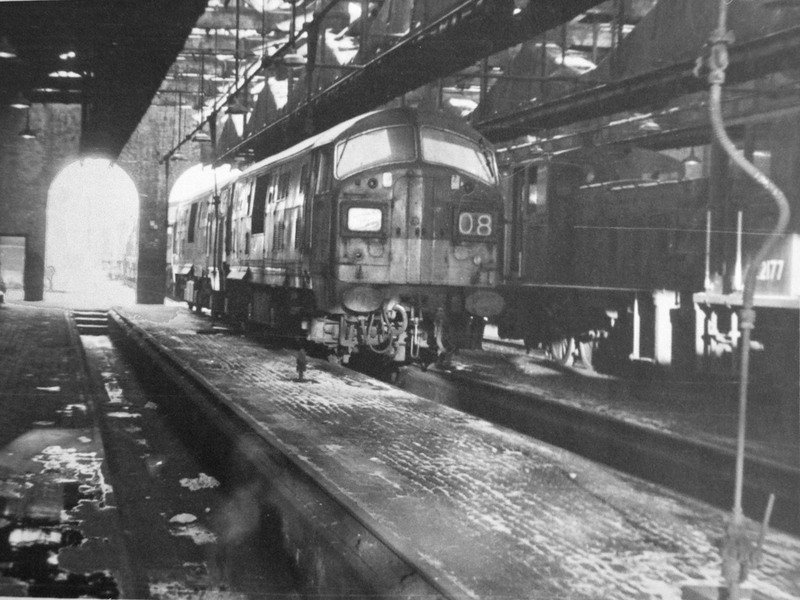 The final locomotive (D9501) arrived around April 1968 and was sold for scrap later the same year. Mid 12/66; 24/12/66; 18/1/67; then returned to service at Bristol, transferred to Cardiff 5/67; noted at Ebbw Junction 16/6/67; stored at Worcester by 16/1/68; (arrived 12/67); returned to service at Cardiff and noted there 26/10/68; stored at Cardiff by 20/2/69 and 10/69. To NCB, Ashington Colliery 11/69. Noted being towed through Gloucester 16/11/69. Noted at Landore 15/7/67; stored at Worcester by spring/68; 16/4/68; 9/6/68; 24&26/7/68; 29/10/68. Sold for scrap to R.E.Trem of Finningley and left Worcester after 29/10/68 and before 2/2/69. Mid 12/66; Returned to service at Bristol,; noted at Gloucester 2/4/67; transferred to Cardiff 5/67; noted at Cardiff 16/7/67; stored at Worcester by 16/1/68; returned to service; reported at Ebbw Vale 26/10/68 and stored at Cardiff 20/2/69. To NCB Ashington Colliery after 20/2/69. Returned to service at Hull. Sold to Stewarts & Lloyds, Harlaxton Quarry. Returned to service at Hull. Sold to NCB Philadelphia Colliery. Returned to service at Hull. Sold to APCM Hope. To Arnott Young, Parkgate, Rotherham for scrap after 9/6/68. Cut up 12/68. 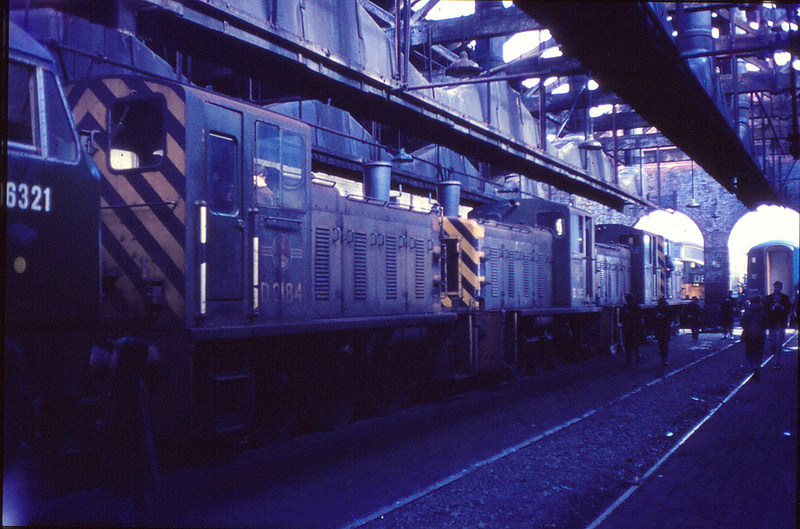 Stored at Worcester 4/67 or 5/67; (stored 5/67). Returned to service at Hull. Sold to Stewarts & Lloyds Corby Quarries. Returned to service at Bristol and transferred to Cardiff 8/67. Withdrawn 10/68. Still stored at Cardiff 8/70.Cut up by Cohen Kettering. Returned to service at Hull. Sold to Stewarts & Lloyds Buckminster Quarries. Cut up c1981. Stored at Worcester in April or May 1967; (stored 5/67). Returned to service at Hull. Sold to NCB Ashington Colliery. Cut up 7/79. To Arnott Young, Parkgate, Rotherham 7/68. Sold to Hargreaves Industrial Services Ltd Crigglestone. To BR Hull. Sold to Stewarts & Lloyds Corby Quarries. Returned to service at Bristol. Transferred to Cardiff 8/67. Noted at Ebbw Vale 26/10/68. Sold to NCB Ashington Colliery. Cut Up 3/84. 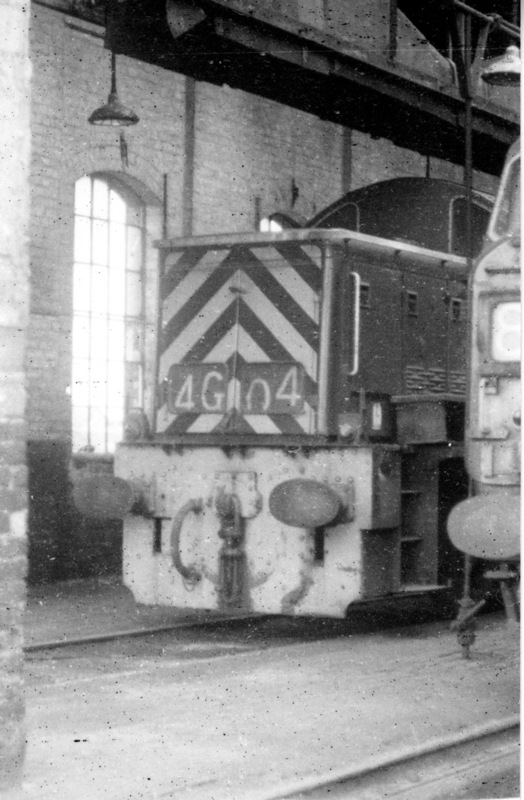 Noted at Margam 16/7/67; stored at Worcester by 16/1/68; Spring/68; 16/4/68; 9/6/68. To Arnott Young, Parkgate, Rotherham for scrap. Cut up 8/68. Returned to service at Hull. Sold to Stewart & Lloyds Buckminster Quarries. Arrived at Worcester 12/67; 16/1/68; Spring/68; 16/4/68; 9/6/68. To Arnott Young, Parkgate, , Rotherham 7/68. Sold to Hargreaves Industrial Services Ltd Crigglestone. Returned service at Hull. Sold to APCM Hope. Returned to service at Hull 1/67. Sold to Stewarts & Lloyds Corby Quarries. Returned to service at Hull. Sold to Stewart & Lloyds Buckminster Quarries. Cut up 10/80. Mid 12/66 &ndash; Mid 1/67; 18/1/67. Returned to service at Hull. Sold to Stewarts & Lloyds Corby Quarries. Cut up 8/82. Class 14 diesel locomotive No.D9501 was stored inside the former Goods Engine shed at Worcester when photographed by Adrian Booth on 26th July 1968. The arrival of six Bristol allocated North British class 22 diesel hydraulic locomotives at Worcester in 1968 was somewhat of a surprise as the class had rarely been seen at Worcester. The six locomotives that were eventually stored at Worcester saw no further service and were all despatched for scrap to Cashmore's of Newport in South Wales where four were noted awaiting scrap on 7th June 1969 with the other two presumed to have already been dealt with by the dismantlers. Spring/68; 12/4/68; 16/4/68; 9/6/68; 24&26/7/68; 29/10/68. To Cashmore, Newport for scrap between 29/10/68 and 2/2/69. Noted at Ebbw Junction 12/68. Cut up by 7/6/69. 24&26/7/68; 29/10/68; 2/2/69; 12/4/69; 4/5/69. To Cashmore, Newport for scrap after 4/5/69 and before 7/6/69. To Cashmore, Newport for scrap after 4/5/69. Cut up by 7/6/69. 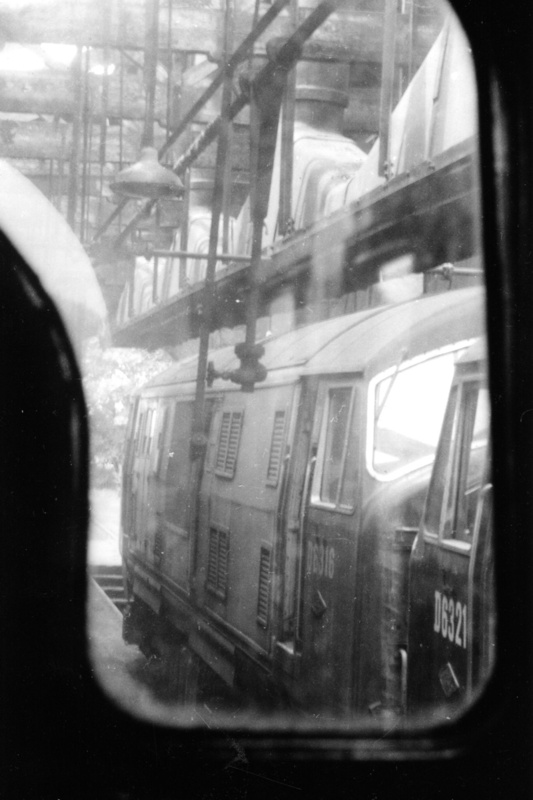 This photograph from inside the cab of a stored locomotive shows class 22's Nos.D6316 and D6321, both still carrying their distinctive diamond shaped North British makers plates, stored inside the Goods Shed at Worcester on 24th July 1968. The photograph was taken by Adrian Booth. We would be delighted to receive any observation, additions or corrections to the above list and also to receive any photographs of any of these locomotives whilst they were stored at Worcester.